Originally the Common Carp fish is from the China. Its natural habitation is up to Turkistan in the east of Caspian Sea. Common Carp was firstly arrived at India in 1930 as the sub species Mirror Carp, It's sample were received from Sri Lanka, and firstly it was kept in Utakmand lake (Ooty). With passing of time the Mirror Carp has become a well known fish of mountain region. The main objective of bringing this fish in India was to increase the edible fish for food in the areas where the temperature is always very low. Scale carp, another species of Common Carp was brought for the first time in 1957 in india, when a few samples were received from Bangkok. On the basis of experimentation It is soon became clear that it is an intense breeders, and very useful for rearing in plain areas. Nowadays the Scale Carp is being reared almost in every state of the the Country including the ponds of Shahdol in Madhya Pradesh. The body is normally shaped, the mouth is like out coming similarly to safar, and a pair of gills. A minor change has became in its physical structure in different areas due to geographical circumstances of the areas so that, therefore it is known as the names like Asian Carp, German Carp and and European carp in the different areas of the world. Normally three species of Common Carp are available. 1.Scale Carp (cyprinus comprobar communis) : The texture of scales on its body is found in a regular shape. 2.Mirror Carp (cyprinus comprobar speculeris) : The texture of scales on its body is found slightly in a irregular shape, the size of scales on its body somewhere is large and somewhere is small and bright in color. In fingerling stage it is a suitable species for aquarium. 3.Leather Carp (cyprinus comprobar nudus) : no any scale is found on its body that means its body is quite smooth. It is an omnivorous fish. Common Carp mainly eats planar bacteria and garbage available at the bottom of ponds. In Fri stage, it mainly eats plankton. It also eats artificial foods. In India its maximum size has seen up to 10 Kg. Its main feature is that it is the fish of temperate zone but it grows as satisfactory even in the environment of low temperature. In 1 year of rearing its weight increases up to 900 to 1400 grams. After being brought in India at the age of three years it has breeding its own in ooty lake. In warm regions it gets sexual maturity only in 3 to 6 months. This fish breeds with ease in stagnant water such as pond , puddle etc. Although it breeds throughout the year but mainly it breeds twice in a year respectively in january - March and July – August, while the Indian Major Carp is breed only once in a year. Common Carp fish lays its eggs mainly on aquatic plants etc. Its eggs sticks to the leaves and roots of aquatic plants due to its stickiness. Its eggs are of feculent pale color. 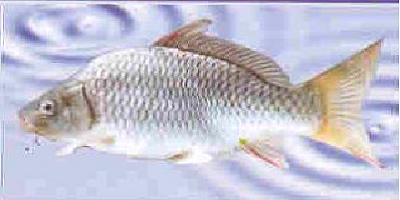 Eggs fertility of Common Carp fish is 1 to 1.5 Lac according to per kg weight. The male and female becomes much actuate to breed if they are kept separate about a month prior to breeding season, Keeping them together into a hapa of limited area after keeping separate for a long time makes them more eager to breed, For storage of eggs in such Hapa and ponds, aquatic plant Hydrilla and coconut husk is used. Common carp fish have external fertilization. Hatching period of eggs is depends on the temperature of water, It takes approximately 2 to 6 days in hatching but if the temperature is high then the hatching becomes complete only in 36 hours. In 72 hours after ending yolk sac it starts normally to roam around and seems to take its food from water. 5 to 10 mm Fri usually takes plankton as its food and 10 to 20 mm Fri eats Cyclops, rotifers etc. Common Carp fish could bear better the low density of oxygen and high density of Carbon dioxide dissolved in the water than any other Carp; therefore it is the most popular species for aquaculture. On an average it becomes 1 kg of weight in a year. It breeds easily so that it has a great importance in the fulfillment of fish seed. Initially when it was introduced in local markets, it was not much liked by the people, but gradually it has become a well recognized edible fish in all the states of the Country. Common Carp fish can also be reared in cages. It is more suitable fish for rearing in seasonal ponds, but it is not considered advisable to accumulate it in deep perennial ponds because of adverse effects on the growth of other fishes due to the problems of fishing and constantly breeding.